B U B B L E G A R M: A few photos from "Garnier" day! A few photos from "Garnier" day! It was soooo hot and we were struggling so much to carry our bags and walk at the same time, That day was probably the only day I didn't re touch my makeup!! :) I had such a lovely time with the girls and hope we can all meet up again soon with the additions of some missing people! Here's a group photo with nearly everybody present... Hah, I'm so tall? No, I'm standing and crouching down on a chair because I was invisible! 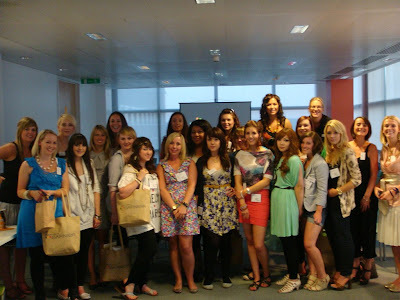 Such a gorgeous bunch of girls you UK'ers are!!! Oh how I long to move to London! Looks like an absolutely fabulous time! looks like you all had such a great time! the goodiebag was amazing ofcourse hahaha.. THE FOOD LOOKS YUMMY BTW..
Everyone looks lovely! How did you not touch up your make-up that day, it was boiling hot so that's amazing. I unfortunately missed the event because I had to work later than expected... grrrrr!!!! Next time!!! It looks like a great event! You all look so lovely n fab!